What is art? What isn't it? What is the definitive religion? There are so many answers to these questions. A compilation would stretch from here to there and back. It seems that the ones who care the most to find an answer are the least likely to be served by it. Or...I know what I like! Here goes; art, or Art, is not about labor, the time it takes to complete something. It's not about colour. It's not about black or white, or the combination of these. It's not about horizontal or vertical. It's not about canvas or paper. It's not about brushes or paint. Not about steel, wood, glass, or concrete. It's not about carving or construction. Not about picture plane, geometry, or perspective. It's not about aesthetics. It's not about right or wrong. It's not about you or me. It's not about the gallery. It's not about big or small. Not about passe or in vogue. Not about shocking. Not about regurgitating. Not about decorating. And most certainly not about pre-conception. So what is it? I don't know? It's an idea. It's a thought. It's a process. An experiment. A path. A choice. It's about what to leave out and what to include. When it's enough. When it's not. About speaking. About convincing, conveying. Making a sound. Removing or replacing. Above all, it's about having an open mind. The spills, drips, spatters of paint are only somewhat controllable. The photographs are cut and pasted to enhance the architecture of the painting. This counters the fluidity of the paint. As the series began to unfold, I became more fascinated with horses. The subtlety of the movement of an eye, or the slight tilt of the head or the swish of a tail, all became more interesting as the horse was no longer just a static object but a subject and a model. The original ideas are still in play, but now it’s both the horse and the paint moving together creating a moment frozen. Andre Petterson explores the contentious symbolism of the suit jacket in his latest body of work, Transition. The widespread, politically-charged graffiti decorating stately Neoclassical buildings in Buenos Aires is impossible to ignore. It is a visual contradiction which exposes the rift between the conservative elite and radical working class. Aesthetically, the bold colours of spray paint and the gestural, script-like application reshape its planar architectural forms into a highly personal expression. For the artist, the vandalized buildings of the Argentine capital reflect, "a need for a generation of people to be heard by way of a visual vocabulary which speaks out against the values of the establishment." In Transition, Petterson utilizes the suit jacket - a Western symbol of masculine authority, formality, and professional prowess - as a vehicle to capture this notion. 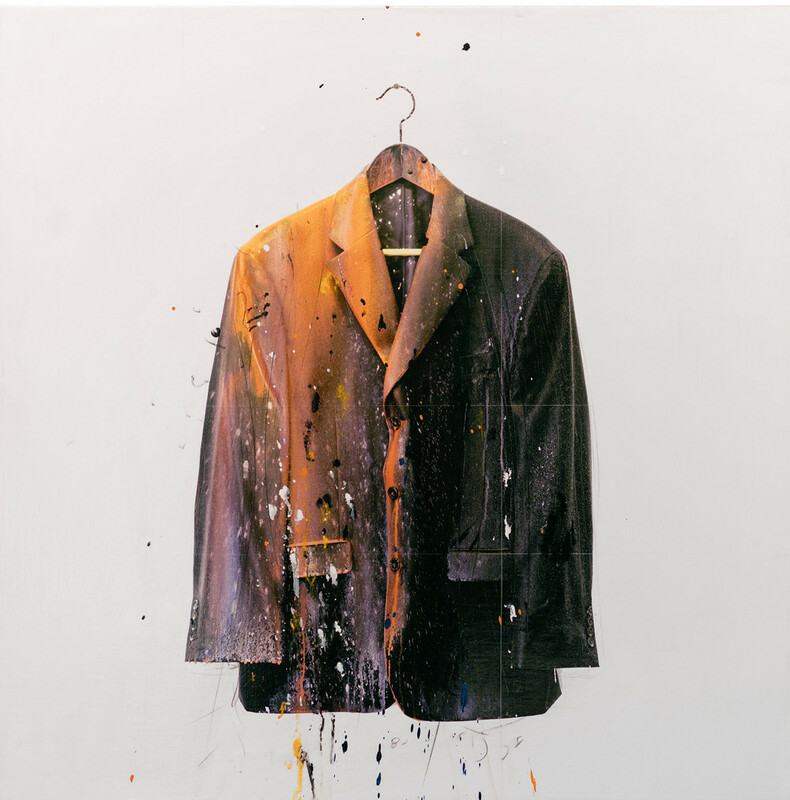 Physical suit jackets, painted in bold colour with a gestural, Sumi-e technique indicative of the artist's earlier work, become politicized sites revealing contradictory ideas of success and oppression in contemporary society. If the suit is a metaphor for the establishment, then the artist uses the garment as a canvas to liberate its socio-political identification. 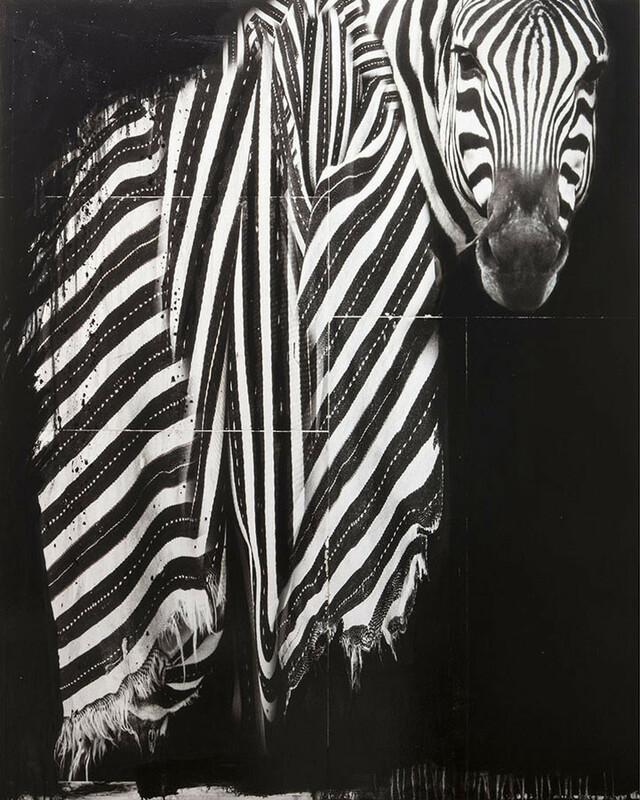 Applying paint to the jacket prior to photographing it adds a new layer of dimension to Petterson’s work, blurring the boundary between photography and painting that has come to be synonymous with his practice. Write. Scribe. Document. Compile. Present. Tell. Book. Type. Compose. Communicate. The visual element of words, books, numbers, music notation and instruments of writing, inspire this current series. I am fascinated with the look of notation, scribbles, codes and markings, rows of numbers and words written in foreign languages. Fabric. Sewing machines. Movement. Light. Music. Line. Drawing. Wire. Year after year, the same collection of images and thoughts keep popping into my head. Sometimes, I think I can explain why. Sometimes, I can’t. People ask if my travels affect my art. I usually say no. What seems to happen is that I become aware of my influences much later. I went to India almost five years ago. It was staggering. The little I visited impressed me in so many ways, yet it is only now starting to sort itself out. Before India, Egypt and Turkey. After that, Morocco and Southeast Asia. The stuff that stays and inspires me from these trips is now clarifying. The sewing machine, for example, keeps recurring. My mother always sewed. She still makes my clothes. I learned about fabric as a child and remain comfortable in that environment. On my travels I became fascinated with people using sewing machines, largely because they are so public. They often work in the street. People seem to work around the clock in the night markets in these developing countries. The streets are dark except for the necessary light. Like Rembrandt. There’s smoke from cooking, and crowds of people moving about in a surreal blur. The ever-changing experience looks and feels like film noir. Sociologically the work talks about idol making, worship, legends, myths and acts of communication. Politically it speaks of enslavement, lack of individual power and group indoctrination; Personally it is an extension of growing up Roman Catholic. The ritual, pomp and ceremony. The Virgin Mary is a goddess whose likeness one worships; The incorporated calligraphy is an suggestion of language; The repetitive image suggests a frieze of an endless scroll without a beginning; The “frames” and “cases” are integral parts of the work because they emphasize the preservation of an icon. The Doll, once cheap, becomes precious and must be protected; The various finishes used on the Doll ( copper, stone, marble, bronze, graphite and silver ) are important earth elements respecting time, such as the bronze age. My work has long been based on time; The Doll has been silver leafed and displayed under glass. “The Shrine” , protected by ropes on a floor covered in calligraphy is the central focus of a series entitled “Stages of Being”. This new work is a continuation of the Doll Series. The first installment is titled Stages of Being . This new body of work is titled Contemplations. In the first series the dolls or figures as I prefer to call them are for the most part, standing, face on with only slight variations in “mood”. These new pieces show the figures seated in profile, alone or two figures facing one another. There is always an object to which the figure or figures look. They contemplate the object. The objects stem from my Catholic roots, and or my fascinations with ancient, or Gothic imagery. “Voids”, the black or empty spaces created by the outline of an unlit window in a cathedral such as the clover or the arch are photographed and become an object to place on a table. A burning candle, spheres or globes, keys, baskets are objects which fascinate me because they suggest an aged human presence. I Have incorporated rusted steel surfaces. This metal as well as the copper in the earlier works are a suggestion of the passing of time. These new works invite the viewer to contemplate the objects and figures alike. In this series, I’m combining a few elements that have fascinated me and in some way, haunted me for a long time, such as the temporal and the absent qualities of light and movement. Being Dutch, I was aware of Dutch painting from an early age, at least from the perspective of the reproductions that graced the walls of my relatives. Rembrandt was everywhere. Cups, pillows, fabrics. The thing that stuck with me was the light. Rembrandt’s use of light was as intriguing if not more so than his subject matter. The light is directed at essential elements. Everything else is assumed. I’ve explored movement in different ways, by spilling paint, by image association - an inanimate object in relation to an animate object. - A horse with its mane spilling down in an overflow. Part of what I’m exploring here is - The split second. The film still. One frame. A click of a shutter. A flash of light. What interests me about dance is the quick bursts of light and the swish of fabric created by the movements. Fabric is like paint, like brush stokes. There is an uncertainty about it. You can choreograph what you will, but a dancer lands differently and moves across a space much like a brush moves paint on a surface. There was intent, but gravity wins. Throwing a piece of paper across the room in to a bucket is much the same. Sometimes it goes in, and sometimes it doesn’t. It seems to me that artists have for a very long time attempted to get the viewer to see past the knowable content of an image. To push past the perceived and to view a work of art as image for it’s own sake - on it’s own terms. Not as Sigmund Freud said “sometimes a banana is just a banana” or as in the painting by René Magritte “ ceci n’est pas une pipe” but to be able to read that which we are convinced is a banana as just a shape. A shape with texture and color. A shape with no specific meaning. I’m not convinced such is possible - it may be wishful thinking. When we see a depiction of an image - a chair for example, we not only see a painting of a chair or a photograph of a chair, we see a chair. We don’t see a shape with color in context or not. We see a chair. If the chair is deconstructed, we see that. But still - we see a chair. I’ve been asked - why the doll? why the crow? why a dog?, and more recently, why a horse? I don’t use images of these figures because of any personal connection to them. At least not in the beginning. They appear in my work because I happened to come across them. The meaning changes and grows as a series unfolds. I found the doll in a junk store while searching for something else. The crow was a gift and has become a little more personally appealing because of it’s perceived “dark” characteristics. - the trickster - the survivor - those elements as I like to refer to them, appeal to me for many reasons. The crow became a model or a prop which I photographed over and over and used in many works in different ways. I began using the dog image the same way - after coming across a mass produced table sculpture which I borrowed and photographed repeatedly. These are not real animals. They are statues or taxidermic specimens. Or - found objects. I’m not sure if objects are really found or merely acquired because of some appeal. The horse is also “not a horse” it is a child’s toy which I altered. This image - like the doll, crow and dog came to me much the same way - there it was in a junk store - I bought it and began to work with it. And like the dragon fly, it was there too. Unlike the others, the dragon fly was real but lifeless when I found it. There is no initial conscious reason for employing any of these images. The purpose or reason comes from the associations of the objects. By the context in which they are used. The idea of Still not Still is one of movement - then of no movement. Depiction of images perceived to have life - those which we know to move on there own and have minds and instincts I use as the still part of the equation. These images are after all not paintings or photos of anything that ever had life - they are just objects. Inanimate things such as balls which appear to be falling or having fallen and poured paint after it has settled become the animate - or the not still . These things never had life but by association they suggest there was movement. The idea behind Inverted Movement - is that the horse,a three dimensional image on a shelf hangs on the wall. A photograph of the same “horse” hangs next to it - only inverted and slightly smaller. The dripped paint - is evidence to movement having occurred. The horse being not a real horse - never moved. Movement is suggested in the transformation of the three dimensional image altered by a photographed and then inverted copy. 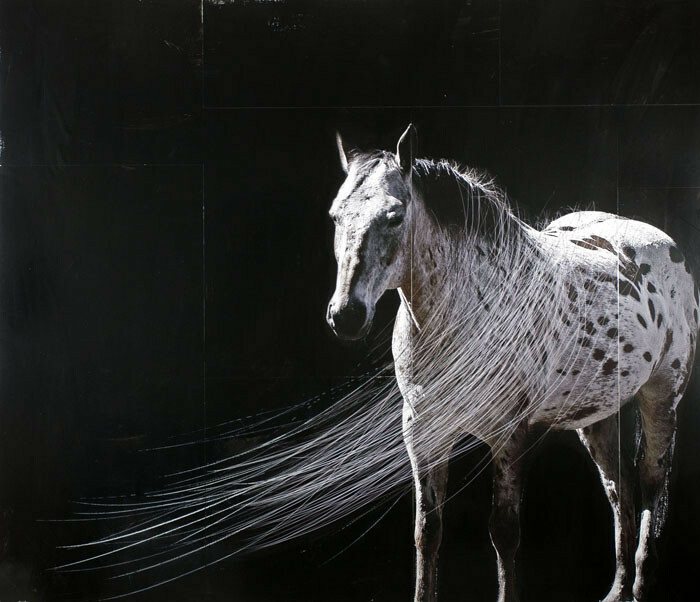 The piece addresses the movement of the dripping of the paint and the stillness of an image of a horse. It’s interesting to have come to a place in photography where for the vast majority, the capturing of movement has taken precedence over a process that began capturing stillness. Fascinating too is the thin line between advertising and art. I believe that sooner or later everything becomes a prop. That nothing is sacred. Images we see on gallery walls become somehow used in advertising. By the same token, advertisements - often large, repetitious and powerful- become the subject of or take part in work which ends up on the gallery wall. It’s a circle I find engaging and growing increasingly more open to interpretation. 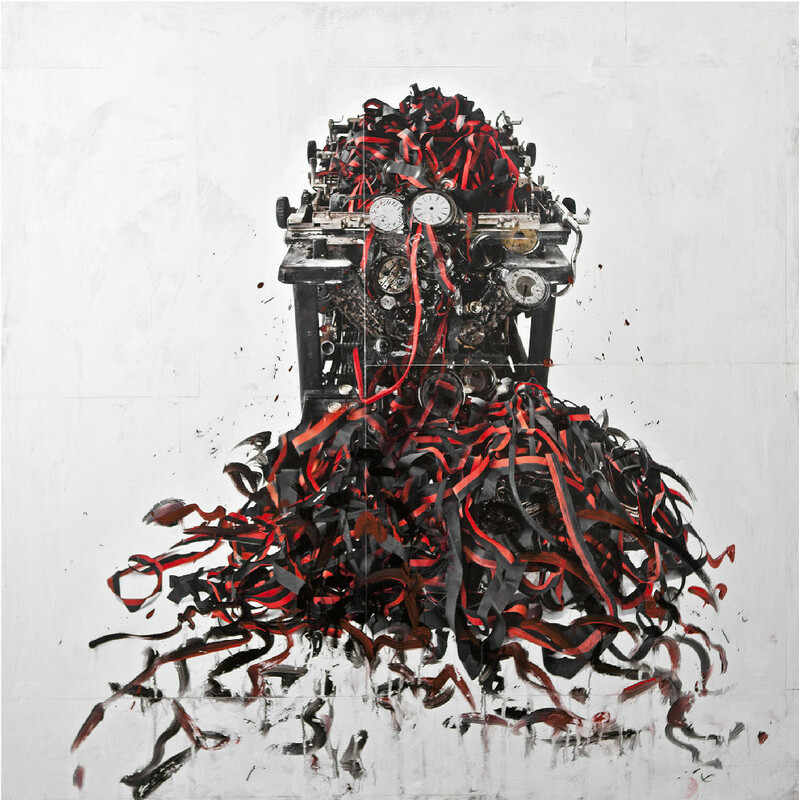 Andre Petterson is an artist who typically presents a series of artwork along a single defined visual theme. These series’ have allowed Petterson to explore and study subjects, including dragonflies, horses, books, dancers, musical instruments, typewriters and sewing machines, using one visual metaphor at a time. His overlying themes have regularly examined the dichotomous nature of his subject’s ability to be both still, yet have movement. Through the study of each set of images, Petterson explores other oppositional relationships, as some previous exhibition titles suggest: Still Not Still, Day and Night, and his current collection Here and There. Here and There includes a more diverse choice of imagery: horses, bicycles, fans, dancers, flowers, etc. 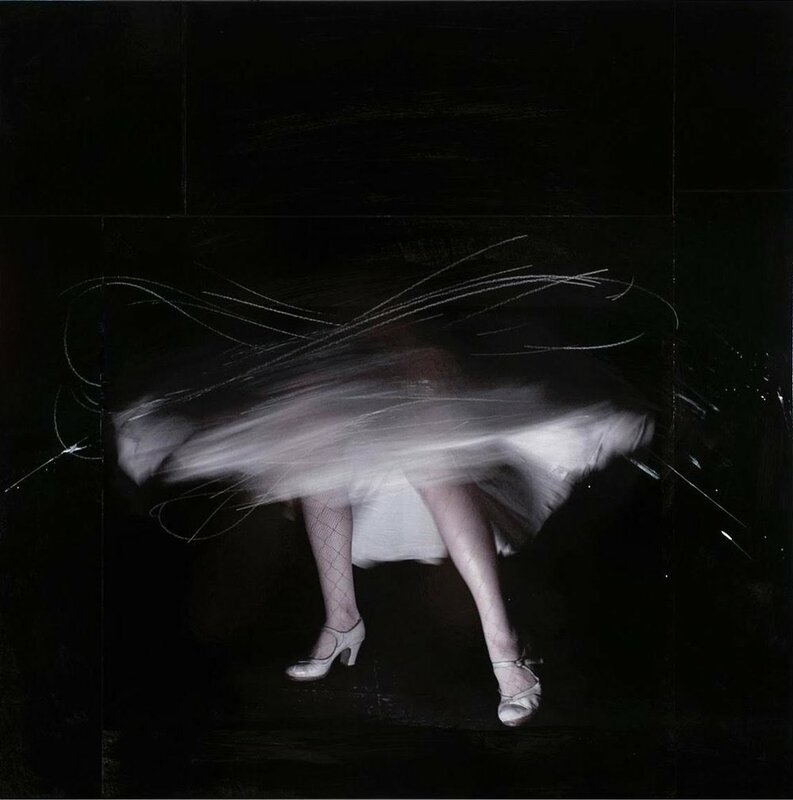 At first glance, the show seems like a retrospective in its representation of subjects that Petterson had previously used in his work, here rather, the artist has employed these images in order to challenge their themes. In viewing the series within this framework, the subjects become representations of past and present, stillness and movement, push and pull. This dramatic tension between these polarities emerges in the formal qualities of his work; the sweeping movement on ‘Pull Right Pull Left’ connects the horses’ counter movements, while the tangled lines on ‘Here and There’ give shape to the futility of two facing fans. Petterson says he is interested in “unlikely alterations” such as those shown in ‘Tempest’, where a small fan pointed at a tree mimics the wind to cause change in the branches. I have always taken photographs, it seems, so my camera, a 35mm Contax, accompanied me through my travels in Europe and North America during the 1980’s. But the photograph which marks the thematic beginning of this series was taken in 1990 at the old Getty Museum in Malibu, California. In this picture,a somewhat frazzled young mother poses with her baby beside an armless classical marble female statue. Her husband stands in the foreground of my image, camera poised to shoot. At this very moment, the infant points her tiny finger, Adam-like, to the ceiling. The ironies in the image seem to me manifold: who really ‘fits’ in the museum space wherein the temporal distance between viewer and object may be hundreds of years? Everything about the woman stands in contrast to the statue: the alert stasis of the sculpture, poised forever to flee, vs.the all-too-human tiredness of the mother (she seems as though she’d rather find a place to sit down); the coy pose of the marble goddess as she attempts to cover her naked breasts and abdomen while the mother, although, of course, clothed, appears unconcerned with any gaze, even that of her husband. When I took this picture, I realized that this kind of situation, this connection of disparate elements in a concise moment, was what I had been looking for, and I would more or less actively pursue these scenes in my travels . Eventually, these photographic ‘discoveries’ would form the basis of this series of photographs. 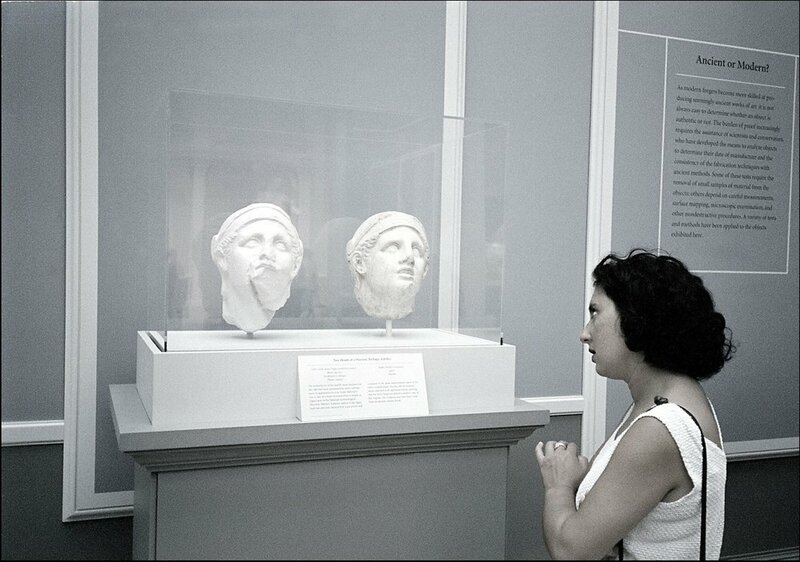 In museums all history is at a standstill; the idea of permanence is enshrined in them. Whether observing a Koons or a Rembrandt, ordinary people confront art in a variety of fashions - bafflement, awe, rejection, sometimes just disinterest. But the act of viewing brings the space of the past to life and provides, for me (the viewer of the viewing), subjects which reflect the nature of both the public and the art with which it interacts. As an artist, I am intrigued with museums and other ‘artificial worlds’. For example, some of my recent photos were taken in Las Vegas, where any sense of the permanence of art and architecture comes completely unraveled. Time and space are collapsed as whole cities within a city are erected and entire eras are reconstructed. The photograph of the Eiffel Tower, for instance - is this the ‘real’ one? And as for the building of Venice...this time around we can be there, and even photograph it. We make do with our own versions of the past. In the dog pictures, the figure of the dog (always the same, and almost always facing away from the viewer) is placed in a variety of contexts: landscapes or public spaces. The dog figure (and it is not a real dog, nor is it meant to look like one) is an odd part of the puzzle. How and where does it fit? As we share the dog’s observational viewpoint, we project both its enjoyment of the scene and its discomfort at being ‘out of place’. After all, it was never really there. And neither were we. However, unlike these self-consciously manipulated images, the photo series was created in a technically straightforward way. The negatives are scanned and printed from a digital file. They are presented as L.E.D. (light emitted diode) prints. They are chemically printed (just like traditional photographs).They are not dye sub or laser prints. This relatively new technique appeals to me because the result is a traditional print, but the way in which it allows me to work (digitally) offers me more possibilities of reaching a final product. There is no excessive electronic manipulation of the image with the exception of colour saturation/desaturation and general cleanup. I remove incidental elements which, had they been left in, would be distracting and would add nothing of value to the photo. I want, above all, to allow the spontaneous nature of the actions and responses of the subjects of the pictures to be the focal point. My most recent art production is a series comprised of paintings, sculptures, prints and ‘steel drawings’ which I have called Conversations and cliches of modern speech. Again, these seem very different from my past work, but I believe that they sum up the issues I have been working with throughout all my art. In the case of these works, the mode of interaction is spoken language. But whereas that is all sound and air, some of these ‘conversations’ are made of heavy-looking steel. The steel medium is itself an opaque surface, an impenetrable object which, while a blank surface, evokes at least the notion of permanence - it has a concrete reality about it. The steel solidifies and congeals a moment - but these images are also dialogue boxes, transmogrifications from the world of comic books. Each piece indicates a conversation in a tension of medium and subject matter, the one defying the other. As understanding is resisted herein, so it is in human communications. Who hears what others say? Who really listens or pays attention? We miss a lot of what is said, sometimes do not say what we mean, or as they say, mean what we say. The irony of the cliche (the original meaning of which is a stereotype plate) is that there are always new ones, yet they seem preexistent. I see these photographs as sort of recognizable surprises, for both myself and other viewers. Because there seem to be an infinite supply of these situations, I continue to look for them.